Yes – but why? And how? Sometimes families can be surprised by the contents of a loved one’s Will – and the surprise is not always a pleasant one. 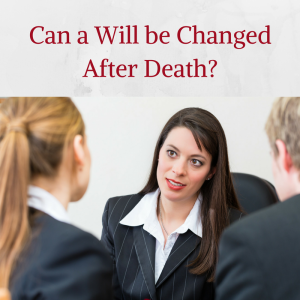 If you felt another family member had been unfairly excluded, or perhaps that a primary caregiver deserves to stay in the family home during their lifetime, is there anything that you can do to change the terms of a Will after a person’s death? Or even to set out terms if your loved one died without a Will at all? The short answer is yes: if all beneficiaries are in agreement, it is possible to amend an Estate Plan (or the standard division of assets, if your loved one died intestate) within two years of death. 1. To provide for someone left out of, or left a smaller inheritance in the Will. Many families may wish to avoid the strife caused by perceived ‘favouritism’ in a Will or Estate Plan. One way of doing this is to amend the Will so that all receive an equal share. You may even wish to apportion a larger share to one family member, if they have more need of financial assistance. Or perhaps a child or grandchild has been born since the original Will was drawn up, and the family are in agreement that the deceased would have wanted to include them. There may be many reasons that an Estate could benefit the family more as a trust than as a simple bequest. You may wish to protect the home of a spouse or partner who has been excluded from the Will in favour of children. You may wish to protect a disabled family member whose assistance from the State would be placed in jeopardy by a large windfall. You may wish to preserve the inheritance for the next generation. If your loved one has failed to see the many potential benefits of a Trust Plan before their death, you can still put one in place yourself. If there is no Will, or if assets have been divided between a surviving spouse and children in such a way that it does not make best use of the surviving spouse’s IHT threshold allowance, surviving family members may wish to alter the distribution of the Estate. You may even wish to place the Estate in Trust for the next generation down, if the inheritance would enlarge your own Estate and make your own beneficiaries liable for a hefty tax bill in the future. How can we amend the Will? The first step is to gain the agreement of any Beneficiaries who would be left worse off by proposed changes to the division of the Estate. If you cannot secure this agreement, there can be no alteration. Once all Beneficiaries and Executors are in agreement, a legal professional can draw up a legal document called a ‘Deed of Variation’. Once all parties concerned have signed, the Deed is legally binding and no further action need be taken (unless the changes have led to an increase in Inheritance Tax owed, in which case you must contact HMRC). The Executors can now proceed to distribute the Estate as outlined in the Deed of Variation.